The Allegra Chaise Lounge is one of our newest and more contemporary designs. This delightful new chaise comes with a show wood base, surface buttoning and piping to the seat edge and back. 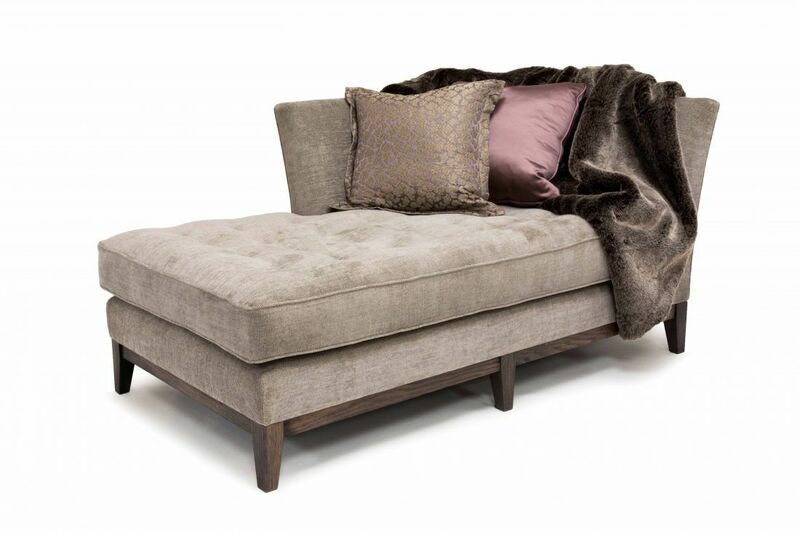 The buttoned seat has a pure feather and down inner cushion to give the chaise extra comfort. The legs are tapered in style and available in a choice of over 30 wood finishes. The Allegra Chaise Lounge is a extremely comfortable and versatile piece and looks great in any interior, living area, landing, bedroom and bay window. Available in 1 standard size, however we do offer bespoke sizes to suit your requirements. The left or right hand orientation is to be advised on order. We have over 30 wood finishes available for the Allegra Chaise base and legs. Please get in touch if you would like to receive any wood finish samples. To ask a question about the Allegra Chaise click here. We'll email you the answer as soon as possible. If you have a question about the Allegra Chaise, fill in the form below and we'll email you the answer as soon as possible.